Logan Nelson scored a regulation goal and the shootout winner Friday as Victoria got past Kamloops 4-3. Nelson, who also added an assist, knotted the game 2-2 when he cut hard to net from the corner to pot his first of the year at 5:52 of the third period. 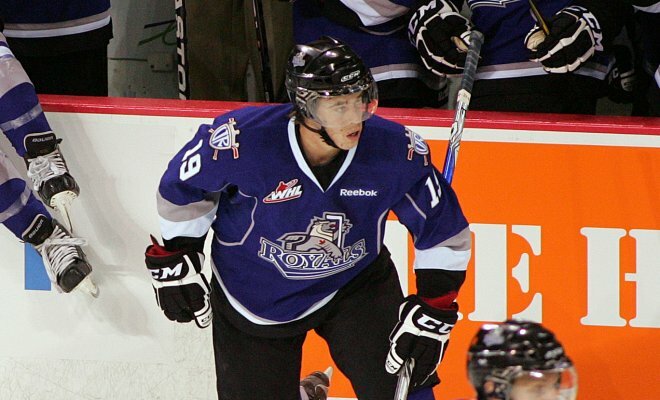 The Royals and Blazers will go at it again Sunday in Victoria. Colin Jacobs scored his fourth goal of the year on a penalty shot and added an assist as Prince George edged Seattle 4-3. Jacobs now has an impressive eight points through the Cougars first three games. The two clubs will finish the two-game set on Saturday. Dan Catenacci saw his three-game goal streak come to an end as Owen Sound held on for a 3-2 win over Guelph. The speedy center currently leads the OHL with 19 penalty minutes. The Attack return to action Saturday when they host Alex Galchenyuk and the Sarnia Sting. Brady Austin finished with an even rating as Belleville dropped a 1-0 decision to Brampton. The Bulls welcome Oshawa to town on Saturday. Joel Armia went without a point for the third straight game as Assat was dealt a 2-1 loss at JYP. Armia reaped 19:41 of work with the Aces securing a total of eight power play opportunities in the contest. Assat is off until Tuesday when they host the Pelicans. Thanks for the update and videos.